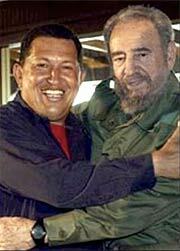 Hugo Chavez or House Democrat? But could have come from Hugo’s blithering pie-hole. Welcome to…..Venezuela. The socialist/communist paradise. Quick, which nation shows average civilian deaths at 33 a day in the last third of 2007? Now name the one where civilian deaths average 19 a day? If you guessed Iraq and Venezuela, you’d have it backward. Shocking? Of course. But true. With even Venezuelan officials admitting their country clocked 12,249 murders in 2007, Hugo Chavez’s socialist “sea of happiness” resembles a war zone. In December alone, Venezuela had 670 murders while Iraq had 476 — and that number is falling fast. Meanwhile, night travel is strongly discouraged and no one wears jewelry openly. Security guards pack big firepower to guard tiny businesses like bakeries, and bulletproof cars are common. Cuban doctors sent for propaganda purposes to help the poor often flee for their safety, leaving boarded up “free” health care kiosks in Caracas slums like Petare and Catia. willingness to fight and to win is the difference between the brave Iraqi and American war effort and the festering mess in Chavez’s chaotic Venezuela. And who gives us this wonderful quote?